Aylesbury’s latest development, The Exchange was opened to the public on 8 March 2019. 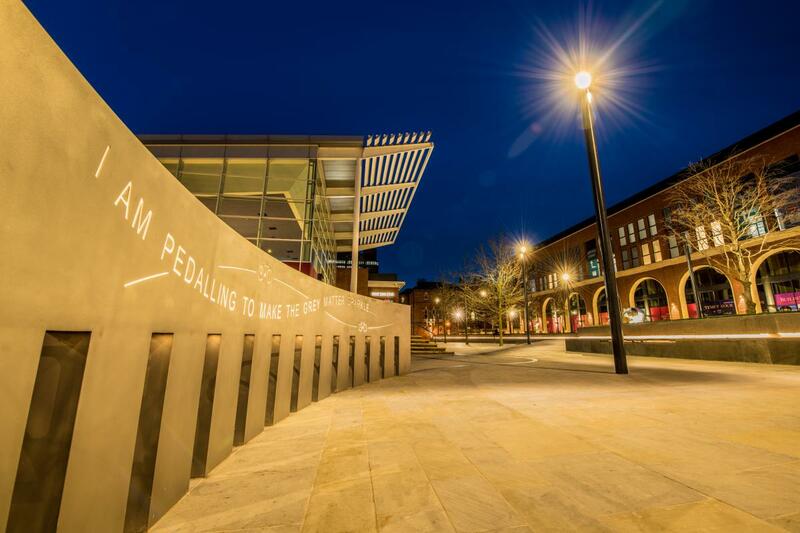 A stunning new public space featuring unique and inspiring contemporary artwork for everyone to enjoy, The Exchange provides a beautiful outdoor setting for Aylesbury town centre’s first purpose-built mixed restaurant, commercial and residential development. The Exchange has been positioned to reflect how modern town centres are changing to meet an increased demand for more leisure dining and town centre homes, with 47 one and two-bedroom apartments above four fantastic new restaurants. The first restaurant, Rococo Lounge, opened its doors on 3 April. Part of The Lounges group, it is a retro-inspired cosy retreat offering food and drink all day. The scheme has been built by AVDC’s development partner Durkan. Hunters Architects have designed the building on behalf of Durkan, and Bradley Murphy Design have designed the new public square. The Exchange is the latest stage in AVDC’s regeneration of the town centre and it’s an important investment to help transform the town into the place of choice for entertainment and arts. 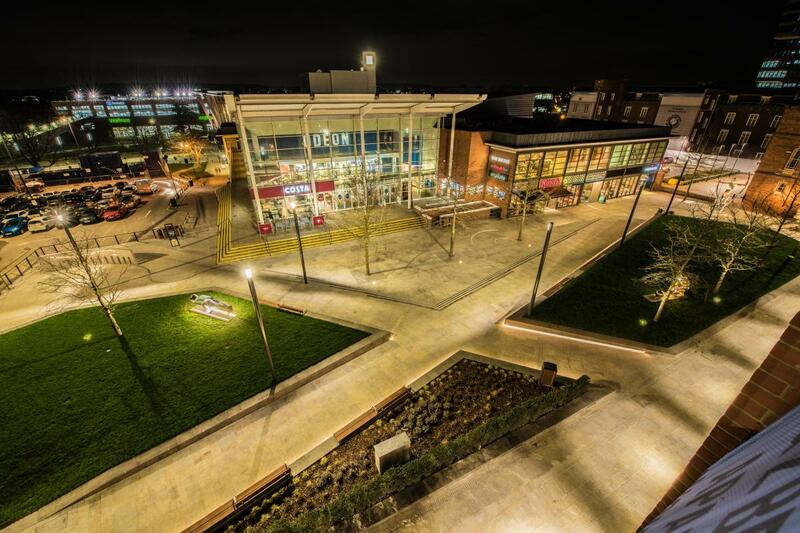 The new public square has been funded by a grant from the South East Midlands Local Enterprise Partnership (SEMLEP), and it recognises the importance of creating high-quality spaces as town centres continue to face the challenges of online shopping. 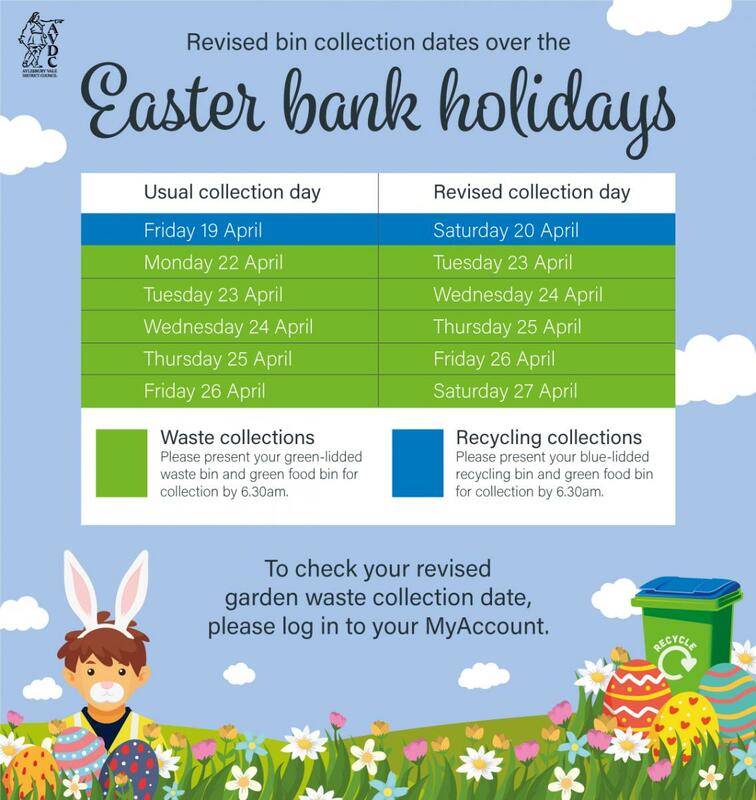 Since 2010, Aylesbury Vale District Council has developed Aylesbury Waterside Theatre, Waitrose, Travelodge, and a new public car park. The University Campus, Aylesbury Vale at the head of the refurbished canal basin opened in 2015, to complete the District Council’s transformation of this area of town. The Exchange is offering 47 one and two-bedroom apartments for rent and sale, visit www.exchangeaylesbury.co.uk for more information. AVDC will own the freehold and Durkan the long lease on the apartments. The apartments will be for private sale and are split between 36 two bed with two bathrooms and 11 one bed, one bathroom. All apartments will either have a balcony or a terrace. Four restaurants will face onto the new public space, each with an outdoor eating space. First to open was Rococo Lounge, with Italian favourite Zizzi coming soon. Although leases have been signed with some other exciting restaurants, names are yet to be announced. AVDC is working to ensure that the restaurants complement those already in the town, and include some international cuisine, as well as being family-friendly. A study undertaken by leading food and beverage consultants, Coverpoint, shows that Aylesbury has significant gaps in the number and range of eating places in the town centre, particularly given the growing population and the national trend for people who like to combine shopping with socialising. Long Lional, a busy pedestrian route to the High Street, will also be improved to help support existing businesses and create new business spaces. The approved plans show three commercial units fronting Long Lional. However, the space is designed to be flexible depending on the occupiers and their requirements. There could be one, two or three tenants who might be retailers, food and beverage operators, or small office based businesses. AVDC will also own this space and receive the rent. 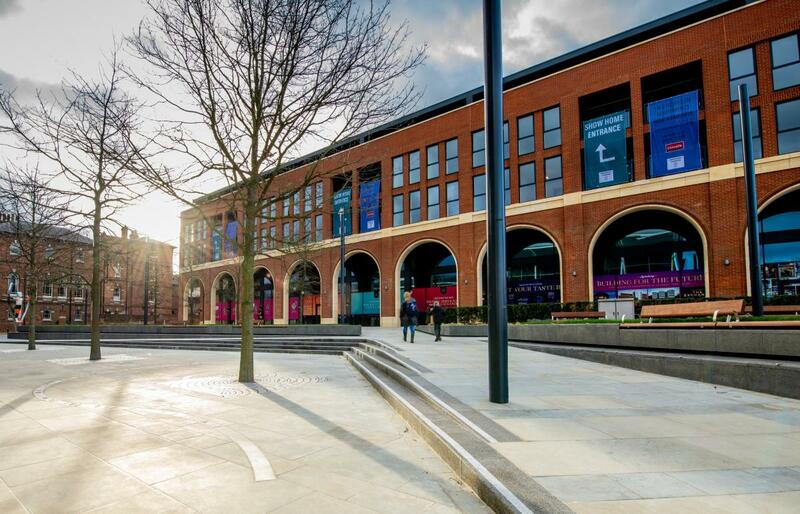 This stunning new public square sits between the new building and the cinema and existing restaurants – Wagamamas, Gourmet Burger Kitchen and Nandos. The public square was conceived by landscape architecture firm Bradley Murphy Design (BMD), following extensive stakeholder consultation. It has been designed to be fully accessible; featuring gentle slopes for people using pushchairs, wheelchairs or other mobility aids and offers a mix of formal and informal seating areas, some of which incorporate mobile device charging points. Three new thought-provoking sculptures by artist Colin Spofforth inject character and colour into the design and are complemented with a series of inspiring quotes, sourced from the local community, that are woven into the street furniture, tree grilles and paving designed by artist Chris Brammall. As well as being a destination in its own right, The Exchange space provides an attractive, easy to navigate, pedestrian route between the town centre and attractions such as the Waterside Theatre, University Campus Aylesbury Vale, Bucks New University and the canal basin. The square is already proving to be a great place to relax and enjoy. 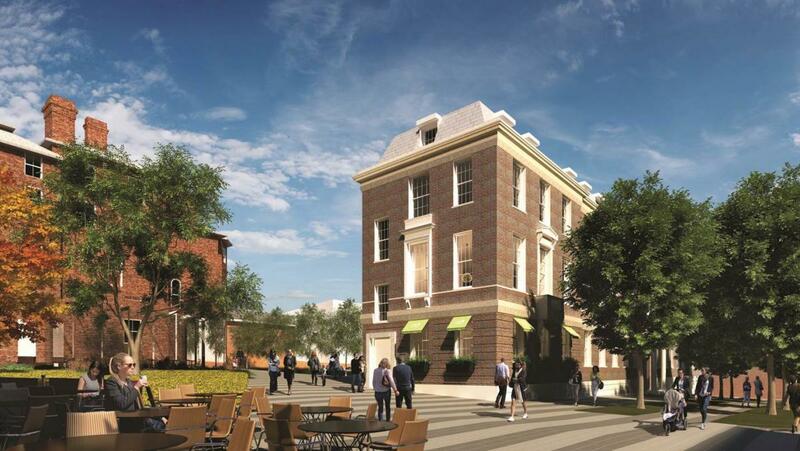 £4.5 million has been approved to transform two of Aylesbury’s other key public spaces - Kingsbury and Market Square. The broader Waterside North scheme received outlined planning permission in 2014. A joint planning application by Bucks County Council and AVDC included land and buildings adjacent to the Exchange Street car park in the ownership of the County Council. A masterplan for the redevelopment of the whole of the Exchange Street car park was submitted at the same time and this will be reviewed as the first phase develops. The Aylesbury Town Centre Plan developed in partnership with key stakeholders, sets out the Vision for the town centre, guiding principles for development and action plans for improving the different areas of the town. Waterside North is included in the actions.